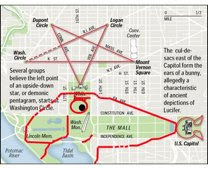 With Dan Brown's The Lost Symbol being set in Washington DC and involving the Freemasons, undoubtedly we're in for more of the same, tired accusations about Masonic symbols in the streets of the capitol being Satanic or otherwise occult talismans of eeeeevil. My favorite remains the Satanic dachshund "designed" into the Mall. But the U.S. is not the only place such theories pop up. 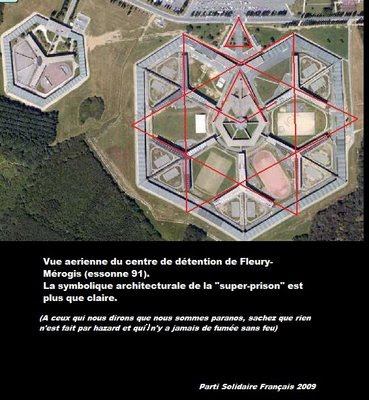 A recent post on Blog Maçonnique reports the French Solidarity Party has denounced the architecture of a French "super-prison" in Fleury-Mérogis as being "Masonic architecture." Fleury-Mérogis is the largest prison in Europe, with some 3,800 prisoners. Here it is from overhead. A Pyramid. A Star of David (or Sign of Solomon, or Zionist flag, depending on your favorite creepy, paranoid kink). 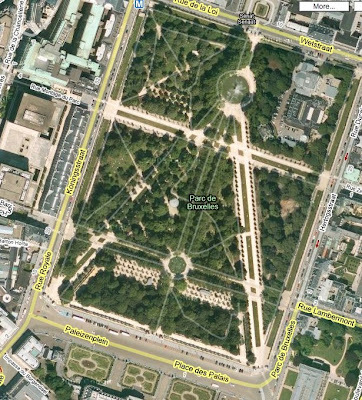 And naturally, a Masonic square and compasses in the center. For what purpose, that remains unclear in the FSP material. 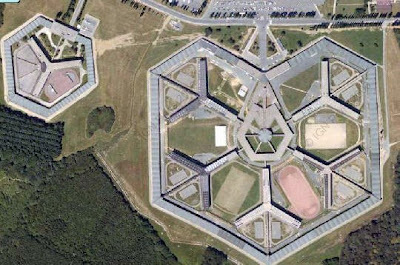 Never mind that the prison design is not dissimilar to famous 17th century French military engineer Sébastien Le Prestre, Seigneur de Vauban's plans for pentagonal fortifications to protect forts from siege. Like this one at Huningue on the Rhine. There's another one of those Satanic pentagrams again! Or is it only evil and Masonic if it is turned upside down? And since we're talking about Vauban, the Place Vauban, in Paris. But if the all-powerful Masons put them there, where are the "squares" to go with the compasses? 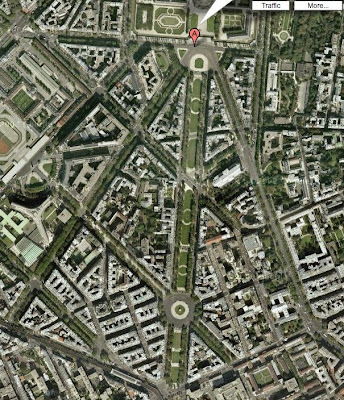 (Well, the Paris streets line up, but Rome and Brussels don't. 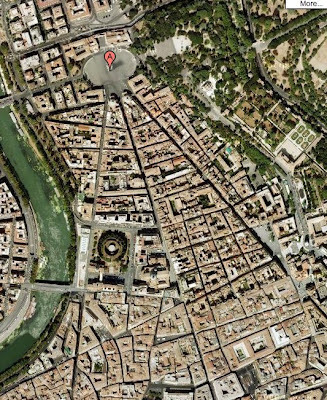 Cue the conspiracy theramin: the left side of the "square" at the bottom leg of the compasses is Boulevard Garibaldi, named after the famed Italian revolutionary and Freemason). 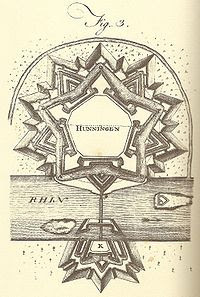 "But if the all-powerful Masons put them there, where are the "squares" to go with the compasses?" Pft! In the tunnels underground, fo course! I wonder what these conspiracy theorists were like when they took geometry in school. Having administered several dozen Rorschach inkblot tests over the last 25 years, I have long been impressed with the capacity of the human mind to form powerful images out of random or meaningless stimuli. Seeing this sort of projective phenomenon at work, either with the Rorschach or with street or building designs, leads to a question: Why did the person / group see this particular image, instead of any other one? What are the psychodynamic forces at work that create this set of fears (and/or hopes)? Why do anti-Masons fear Masonry so? The answer to this question will say a lot about the psychology of our society, and it won't be pretty. Thank you, Chris, for posting this. What answer do you come up with? What are your thoughts of the milieu's paradigm? Is it wrong to be vigilant and concerned of the secrecy in the actions and intentions of those in positions of great power and influence? I'm reminded of one of my favourite Peanuts cartoons when they're staring in the clouds and either Linus or Lucy sees profound shapes, then Charlie Brown remarks he can see a ducky and a horsie. Old Navy and the Scottish Rite? "Scottish Rite For The 21st Century"